Hamagin Space Science Center (はまぎん子供宇宙科学館) is the science museum that kids can learn about the space and science by hands on experiencing. The building is 5 stories and 2 levels of basement and the entire building looks like space ship. Each floor has a different concept of space kids can learn. 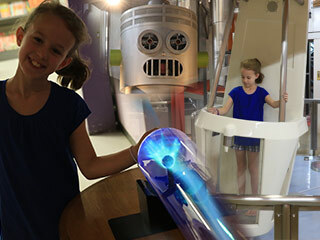 There are many facilities and activities that kids can learn about space science. Admission: 400 yen for adult, 200 yen for junior high and under. Free for under 4 years old. Planetarium: 600 yen for adult, 300 yen for junior high and under. Closed: 1st and 3rd Monday (if the monday is holiday, closed on Tuesday.) Year end holidays. 1. use JR Negishi Line to Yokodai Station.